Warehouses,hunan great steel pipe co.,ltd. Hunan great steel pipe co.,ltd was founded in 1978. The founders felt that they could provide that market not only with the needed products but also superior service. Our reputation grew rapidly as members of the industry and the municipal community came to rely on our quality products, higher level of service, timely order processing, vast inventory and willingness to make every effort to make our customers happy. Our first office was Hunan Steel Industrial Zone where we had 3000 sq. ft of office space with a ¼ acre pipe yard. Our other two locations are Tianjin, China and with warehouse is 15,000 sq. ft. with a 3 acre yard and they currently employ 130 people. another is located in Heibie, China, They specialize in the actuation of seamless steel pipe and welded steel pipe products. Heibei"s warehouse is 20,000 sq. ft. with a 3 acre yard. 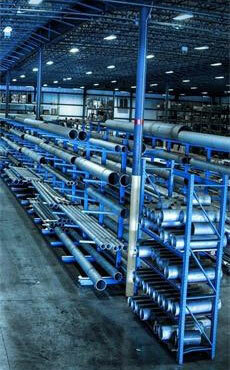 They employ 90 people and specialize in pipe fittngs products. For the warehouses, we was preparing to upgrade its warehouse processes to improve order accuracy and inventory visibility, they employed high-tech talent, including hardware, software, integration and support.